White sharks and tuna seem to be two very different types of fish. White sharks, or mackerel sharks, are large, fast-swimming sharks found in oceans worldwide. They are heavily built sharks, sometimes weighing nearly twice as much as sharks of comparable length from other shark families. Tuna, on the other hand, is a type of saltwater fish with various sizes. A bullet tuna is only 50 cm long and weighs 1.8 kg, whereas an Atlantic Bluefin tuna can be 460 cm long and weigh 684 kg. But now researchers find that white sharks and tuna share some metabolic genes due to a gene selection. This may cause a strong phenotype convergence in the two types of fish. The finding is published in Genome Biology and Evolution. Researchers from Imperial College London in England, University of Sheffield in England, University of Aberdeen in Scotland, University of Bielefeld in Germany, and Station Zoologica Anton Dohrn in Italy conducted the study. Previous research shows that the convergence between white sharks and tuna is characterized by their centralized red muscle, a distinctive swimming style (stiffened body powered through tail movements) and elevated body temperature. In addition, both types of fish have elevated white muscle metabolic capacities. All these traits are unusual in fish and more likely evolved to support their fast-swimming, predatory behavior. 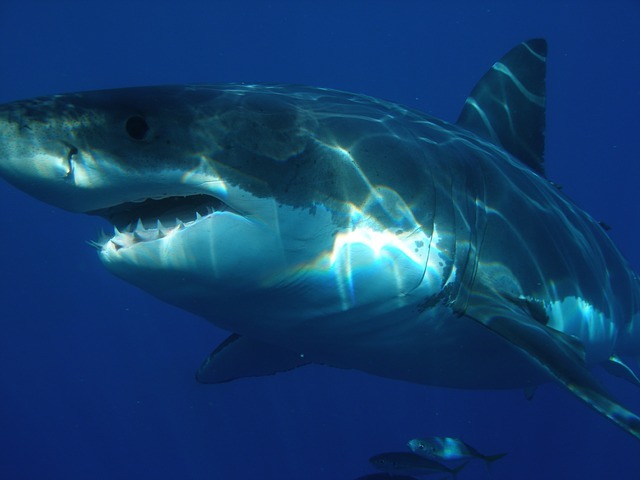 In the current study, researchers hypothesized that the convergent evolution in white sharks and tuna was driven a selection on a set of metabolic genes. They collected white muscle samples from 6 tunas, 1 white shark, and 3 other sharks, and supplemented this data set with previously published RNA-sequence data. Using 26 species in total, which included 7,032 tuna genes and 1,719 shark genes, researchers constructed the phylogenetic tress and analyzed gene selection. They inferred that several genes related to metabolism were under selection. In addition, they found that the same one gene, glycogenin-1, evolved under positive selection independently in tuna and white sharks. This finding suggests that at the gene level, there were convergent selective pressures that lead to similar physiological features in white sharks and tuna. Citation: Ciezarek AG, et al. (2016). Substitutions in the glycogenin-1 gene are associated with the evolution of endothermy in sharks and tunas, Genome Biology and Evolution, published online. doi: 10.1093/gbe/evw211.